Online Coupons Save Time, Money and Effort! Although conventional wisdom and our sunny demeanors agree that the American economy is starting a healthy turnaround, the recent economic debacle has served an excellent purpose: reminding all of us to slow down, simplify and spend our money wisely. Libraries have come out on top, of course, as one of the best ways to stretch one's ever-thinning dollar. Where else can you find free books, movies, magazines, newspapers, Internet access, computer classes, lectures, concerts and myriad social activities under one roof? It seems like the only thing your library can't do for you is put food on the table...and that's where smart shopping and coupons come in handy. Now we can't all be Coupon Queens -- who has the time? -- but that doesn't mean we should avoid coupon culture altogether. There are many quick and easy ways to find excellent coupons and savings, even the familiar ones from the Sunday newspapers, available on any computer with an Internet connection. 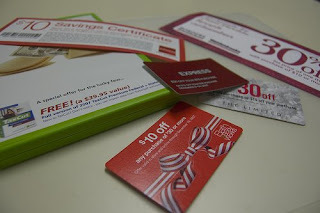 If you do have the time and would like to use coupons like a pro, local coupon maven Louise has an excellent introduction to the art of maxing out your coupons. She recommends things like not cutting out coupons from circulars until you're at the store, creating coupon lists and trying to use multiple coupons at a time. Although it sounds simple here, she has refined and explains her method carefully to produce maximum savings. If you have a printer and Internet-connected computer or come in to use ours at the library, you can download coupons from the Sunday circulars and Internet-only specials. Some of the best sites to find these coupons include, Coupon Tom, Consumer Queen, Sunday Saver, Deals 2 Buy, Grocio and Red Plum. Many of these websites cover the same ground, so it's not a bad idea to check them all out and see which are the best fit for the way you like to browse and search. Did you know that you don't even have to buy the Sunday paper to see many of the deals you would normally find in the circulars? Websites like Sales Circular comb through the paper to find all the best deals and even free after rebate items in many different categories including computers, jewelry, tools and more. Do you and yours like to rock out from time to time? Then be sure not to miss Recess Monkey, Seattle's premiere children's music band. What do school teachers do when not in school? They play in a band, of course! Stop by Monday, June 29 at 3 p.m. in the Community Room to catch this super band. Want even more music? Stop by Tuesday, from 7-8 pm, for Music in Action with Rich Glauber. That's right, music and movement for lots of fun. Can't make it to either event? The library has CDs of music from both artists. For Recess Monkey, click here...for Rich, click here. Some of my favorite summer reads for grownups were written for children (or at least, that's where they're shelved). I may be biased towards children's books because of my job, but I'd like to think that these are great reads regardless of the original intended audience. Spend your afternoon with one of these super summer tales. My One Hundred Adventures by Polly Horvath. While most of us dream of weekend trips to the beach, 12-year-old Jane lives there year-round with her free spirited poet mother and her three siblings. Jane's summer becomes more than she bargained for when she ends up on Bible delivery trips with her pastor, meeting her mother's ex-boyfriends, and babysitting a group of unruly kids. The Penderwicks: a Summer Tale of Four Sisters, Two Rabbits, and a Very Interesting Boy by Jeanne Birdsall. *Sigh* This is one of those old fashioned summer tales that's just pitch-perfect. Four sisters, ages 4 through 12, spend the summer with their widowed father in a cottage on the estate of a local boy and his snobbish mother. Adventure, young love, and that feeling of summer days. A Long Way from Chicago by Richard Peck. Peck has a knack for writing historical fiction like he's sitting right there in front of you spinning a tale while you both relax on a summer evening. The Great Depression may be happening, but that doesn't make life in less exciting for a young boy on his annual summer visit to his larger-than-life grandmother. It's been 20 years since Ignatius B. Grumply wrote his last book. As a children's writer of horror stories, Ignatius (who hates children) is in a bit of slump and needs a quiet place to finish (or rather, start) his book over the summer. What he doesn't bargain for is that the house isn't empty, but the home of an eleven-year-old boy named Seymour, his cat, oh, and a ghost named Olive. Told through letters and drawings, Dying to Meet You (Book One in the 43 Old Cemetery Road series) by Kate Klise and M. Sarah Klise is fantastic! At around 150 pages, this slim book manages to combine mystery, dark humor and a dose of reality sure to be a hit with you and yours. Question - Can zoo animals be any cooler? Yes, when they're featured in life-size pictures with fun facts and amazing details. In Life-Size Zoo by Teruyuki Komiya you can count the hairs on the zebra's chin, measure the giraffe's tongue, and find out what a rhino's horn is made of. In addition to the amazing photography, each animal is accompanied by a cartoon strip highlighting their behavior, habitat or other interesting tidbit. This over-size book with fun foldouts is sure to be a hit with your little one. Hank Zipzer is in the 5th grade, and he is not the strongest student. In fact, he's struggling so much that he just found out he has to have a peer tutor for Math. And as if it's not enough that he has to do peer tutoring, he finds out that his peer tutor is Miss Goody Two-Shoes herself, Heather Payne. And as if that isn't enough, Heather announces to the whole 5th grade that Hank needs tutoring. But on the same day, Hank also finds out about something exciting: the school play. The school is going to put on Anna and the King of Siam, and Hank feels in his bones that the lead role is made for him. To get into character at home, he says things like, "The king has arrived. Please show the proper respect," and "Hear ye, hear ye, loyal subjects, the king is home for his royal snack." His dad doesn't think that is so funny. His dad also doesn't think it's so funny when he finds out that he is failing math. In fact, his dad finds it so not funny, that he considers not letting Hank try out for the play. Instead, they make a deal: Hank can try out for the play, and if he gets the part, he can play it, as long as he gets a B+ on his math test. No problem, right? Wrong. The last time he got a B+ was in "plays well with others," and that was in pre-school. Does Hank get the lead in the play? Does he tolerate tutoring with the perfect Heather Payne? Does he meet his dad's grade requirement? To find out, read The Curtain Went Up, My Pants Fell Down, by Henry Winkler and Lin Oliver. This book is part of the series, Hank Zipzer: The World's Greatest Underachiever. No need to read the titles in order. They are great fun, and written by the Fonz himself. Kids 3rd through 6th grade will probably enjoy them. Time for a third installment of my favorite new(ish) picture books, just in time for summer reading! Simply click on the titles to check our holdings or to place a hold. Beautiful illustrations and rhyming text pay homage to a new day, with promises for the future in its "perfect piece of time". A humorous examination of the urban legend about alligators living in the sewers of New York. When family members see the consequences of forgetting to write things on the grocery list, they not only do better at keeping the list up-to-date, they also help with the shopping to ensure they never again eat pickled grubs. I have to admit...I'm a Jon Agee fan. Terrific and The Retired Kid are great picture books. Jon Agee's Palindromania is a collection of amazing palindromes (think words like Mom, Dad, race car, except in longer phrases and even sentences!). 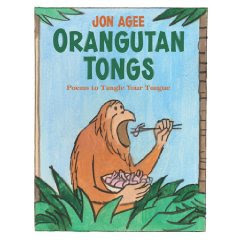 I am currently gushing over Orangutan Tongs: Poems to Tangle Your Tongue, a collection of deceptively simple looking sentences that do not flow smoothly off of your tongue. I visited some grade school students this morning and judging from their laughter, they liked it too. With great illustrations, sly jokes, and word combinations that induce giggles, this is a book to share aloud with your young ones. Gradeschoolers especially get why this is funny. It's great for them to see a grownup struggling with words and still enjoying it. What happens if "you offer moose muesli" or "should you shove a surly soldier"? For extra fun, have a word hunt with your child for other weird word combinations.